Come and join us once a month for a wonderful Demo Day. Together we will create a beautiful Make and Take for FREE using BRAND NEW products. Come anytime between 9 AM and 4 PM to do the free Make and Take and you will receive 10% Off the featured product that month! If you are a BPC Member, you will receive 25% off the demonstrated item! Our crop room is open on Demo Days, so it’s a PERFECT day to come spend the day cropping! Make it a regular date for yourself and your friends! 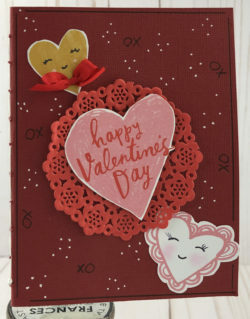 This month for Demo Day we will be giving the Book Binding Guide from We R Memory Keepers a try. The Book Binding Guide has the supplies you need to easily make a saddle, copic or Japanese bound book. The package includes one bookbinding guide, which can pierce through 8 sheets of paper, book board and leather. The guide comes in a handy felt case. The guide is part of the Journal Studio Collection by We R Memory Keepers. We are going to make a simple bound book on Saturday but you can do so much more with this tool. The different bindings you can make are so beautiful. Come and join us Saturday, February 9th from 9 AM to 4 PM.